NOTE I used a basic chocolate icing to top the cake then sprinkled with raw brown sugar. you can spread melted butter over cake then top with sugar as per a usual cinnamon cake! Preheat oven to 170°C. 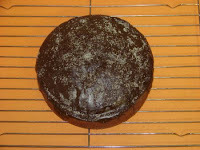 Grease and line a 20cm-round cake pan with baking paper. Beat butter, sugar and vanilla together until pale and creamy. Add eggs, one at a time, beating well after each addition. Sift flour, cocoa and cinnamon together. Fold in alternately with milk in 2 batches. Spoon into pan and smooth surface. Bake for 1 hour or until skewer inserted into the centre comes out clean. Cool in pan for 15 minutes. Carefully turn out onto a wire rack. Put the flour, baking powder, baking soda, cocoa, sugar, and 3/4 cup of the chocolate chips into a large bowl. Pour all the liquid ingredients into a measuring jug. Mix the dry and wet ingredients together, remembering that a lumpy batter makes the best muffins. Spoon into the prepared muffin cases. 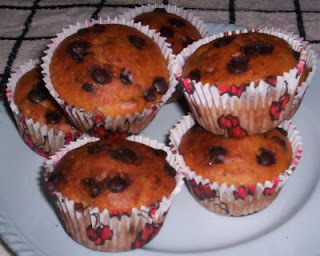 Sprinkle the remaining 1/4 cup chocolate chips on top and then bake for 20 minutes or until the muffins are dark, risen and spring. I saw this recipe on cooks.com and thought it sounded nice, was intrigued by the idea of the mustard in the sauce. 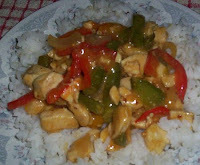 I tried it recently & its very good, I'd certainly make it again. besides a bit of chopping its easy enough for a week night too! 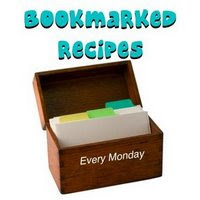 this is my entry to bookmarked recipe's for the coming monday, which is being hosted by Deeba from passionate about baking! Rinse chicken and pat dry. Cut chicken into 1 inch pieces. 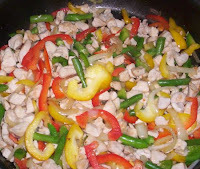 For sauce, stir together the apple juice, honey, mustard, cornstarch and seasoning packet from the frozen stir-fry vegetables. Set sauce mixture aside. Preheat a wok or large skillet over high heat; add oil. (Add more as necessary during cooking.) Stir-fry vegetables and onions in oil for 3-4 minutes or until crisp-tender. Remove vegetables from wok. Add half of the chicken to the hot wok. Stir-fry about 3 minutes or until no longer pink. Remove chicken. Repeat with remaining chicken. Return all chicken to the wok. Push from center of wok. Stir sauce; add to the center of the wok. Cook and stir until thickened and bubbly. Cook and stir for 2 minutes more. Return vegetables to the wok; toss to coat with sauce. Cook and stir for 1 minute or until heated through. Serve over chow mein noodles. Makes 4 servings. Recently I had the lovely surprise of recieving some much appreciated awards. firstly the very sweet Kitchen Flavours from yummy food awarded me the beautiful site award and the best blog darts thinkers award. thank you Kitchen flavours your kindness means a lot. I would like to pass these awards to, Donna, Ruth, and Faery. Also the lovely Faery from Faery's Kitchen awarded me the wylde woman award which I very much appreciate, I would like to pass this award to Kitchen flavours & Ruth. Faery has been so sweet in also awarding me the amazing friendship award and the lamp of luck award, which I give to Ruth, Donna from is she cooking or what, Robin, Dani, Happy Cook, and all who visit my blog! Kitchen Flavours and Faery, thank you so much ladies you are both really sweet & I appreciate the awards very much!! I've made ribs lots of times but have never made them with American style pork ribs (we use a different cut of rib here in Aus) have always been keen to try the American kind so had bookmarked a few recipe's ready for when I got the chance. 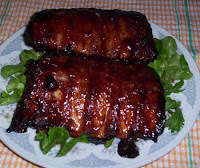 recently I spotted American style ribs at my butcher & of course I jumped at the chance to try them!! the result? delicious!! 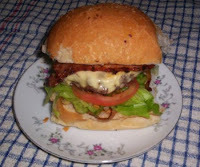 I will be making these again many times. 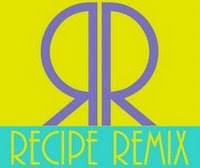 am sending this to Ruth for bookmarked recipe's. Combine tomato sauce, bbq sauce honey, mustard, syrup,sugar, and salt and pepper in a ceramic dish. Add ribs and turn to coat. Cover and refrigerate for at least 1 hour.